"Schiphol" redirects here. 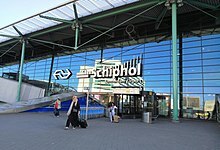 For the railway station, see Schiphol Airport railway station. Amsterdam Airport Schiphol (IATA: AMS, ICAO: EHAM), known informally as Schiphol Airport (Dutch: Luchthaven Schiphol, pronounced [ˌlʏxtɦaːvə(n) ˈsxɪp(ɦ)ɔl]), is the main international airport of the Netherlands. It is located 9 kilometres (5.6 miles) southwest of Amsterdam, in the municipality of Haarlemmermeer, North Holland. It is the third-busiest airport in Europe in terms of passenger volume. The airport is built as a single-terminal concept: one large terminal split into three large departure halls. Schiphol is the hub for KLM and its regional affiliate KLM Cityhopper as well as for Corendon Dutch Airlines, Martinair, Transavia and TUI fly Netherlands. The airport also serves as a base for EasyJet, LEVEL, and Vueling. Schiphol opened on 16 September 1916 as a military airbase. The end of the First World War also saw the beginning of civilian use of Schiphol Airport and the airport eventually lost its military role completely. By 1940, Schiphol had four asphalt runways at 45-degree angles. 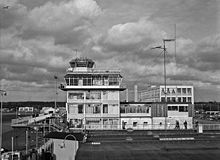 The airport was captured by the German military that same year and renamed Fliegerhorst Schiphol. The airport was destroyed through bombing but at the end of the war the airfield was restored quickly. In 1949, it was decided that Schiphol was to become the primary airport of the Netherlands. Schiphol Airport is an important European airport, ranking as Europe's third busiest and the world's eleventh busiest by total passenger traffic in 2017 (12th in 2016, 14th in 2015, 2014 and 2013 and 16th in 2012). It also ranks as the world's fifth busiest by international passenger traffic and the world's sixteenth busiest for cargo tonnage. 63,625,664 passengers passed through the airport in 2016. Schiphol's main competitors in terms of passenger traffic and cargo throughput are London-Heathrow, Frankfurt, Paris–Charles de Gaulle, Istanbul-Atatürk and Madrid–Barajas. In 2010, 106 carriers provided a total of 301 destinations on a regular basis. Passenger destinations were offered by 91 airlines. Direct (non-stop) destinations grew by 9 to a total of 274. Regular destinations serviced exclusively by full freighters (non-passenger) grew by eight to a total of twenty-seven. The airport is built as one large terminal (a single-terminal concept), split into three large departure halls, which connect again once airside. The most recent of these was completed in 1994 and expanded in 2007 with a new section, called Terminal 4, although it is not considered a separate building. A new pier is to be opened in 2019 with a terminal extension planned to be operational by 2023. Plans for further terminal and gate expansion exist, including the construction of a separate new terminal between the Zwanenburgbaan and Polderbaan runways that would end the one-terminal concept. Because of intense traffic and high landing fees (due to the limit of 500,000 flights a year), some low-cost carriers decided to move their flights to smaller airports, such as Rotterdam The Hague Airport and Eindhoven Airport. Many low-cost carriers, such as EasyJet and Transavia, however, continue to operate at Schiphol, using the low-cost H pier. Lelystad Airport is currently being expanded aimed at accommodating some of the low-cost and leisure flights currently operating out of Schiphol, eventually taking up to 45,000 flights a year. Before 1852, the entire Haarlemmermeer polder in which the airport lies was a large lake with some shallow areas. There are multiple stories of how the place got its name. The most popular story is that in the shallow waters sudden violent storms could claim many ships. Winds were particularly strong in the Schiphol area since the prevailing wind direction is from the south-west, and Schiphol lies in the north-eastern corner of the lake. In English, Schiphol translates to "Ships Hell", a reference to many ships supposedly lost in the lake. When the lake was reclaimed, however, no shipwrecks were found. Another possible origin of the name is the word scheepshaal. A scheepshaal is a ditch[clarification needed] or small canal in which ships would be towed from one lake to another. A third explanation would be that the name derived from the words scip hol. This is a low-lying area of land (hol) from where wood would be obtained to build ships. After the lake was dredged in the mid 1800s, a fortification named Fort Schiphol was built in the area which was part of the Stelling van Amsterdam defence works. 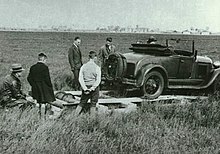 Schiphol opened on 16 September 1916 as a military airbase, with a few barracks and a field serving as platform[clarification needed] and runways. When civil aircraft started to use the field (17 December 1920), it was often called Schiphol-les-bains. The Fokker aircraft manufacturer started a factory near Schiphol airport in 1919. The end of the First World War also saw the beginning of civilian use of Schiphol Airport and the airport eventually lost its military role completely. By 1940, Schiphol had four asphalt runways at 45-degree angles, all 1,020 metres (3,350 ft) or less. One was extended to become today's runway 04/22; two others crossed that runway at 52°18′43″N 4°48′00″E﻿ / ﻿52.312°N 4.800°E﻿ / 52.312; 4.800. The airport was captured by the German military that same year and renamed Fliegerhorst Schiphol. A large amount of anti-aircraft defences were installed in the vicinity of the airport and fake decoy airfields were constructed in the vicinity near Bennebroek, Vijfhuizen and Vogelenzang to try to confuse allied bombers. A railway connection was also built. Despite these defences, the airfield was still bombed intensively; an exceptionally heavy attack on 13 December 1943 caused so much damage that it rendered the airfield unusable as an active base. After that, it served only as an emergency landing field, until the Germans themselves destroyed the remnants of the airfield at the start of Operation Market Garden. At the end of the war, the airfield was quickly restored: the first aircraft, a Douglas DC-3, landed on 8 July 1945. A new terminal building was completed in 1949 and it was decided that Schiphol was to become the primary airport of the Netherlands. Expansion came at the cost of a small town called Rijk, which was demolished to make room for the growing airport. The name of this town is remembered in the name of the present Schiphol-Rijk industrial estate. In 1967 Schiphol expanded even further with a new terminal area at its current location. Most of the 1967 terminal is still in use today (Departure Halls 1 and 2) as are parts of the original piers (now called C, D and E). Dutch designer Benno Wissing created signage for Schiphol Airport, well known for its clear writing and thorough colour-coding; to avoid confusion, he prohibited any other signage in the shades of yellow and green used. The new terminal building replaced the older facilities once located on what is now the east side of the airport. The A-Pier (now C-pier) of the airport was modified in 1970 to allow Boeing 747 aircraft to use the boarding gates. A new pier (D, now called F) opened in 1977, dedicated to handling wide-body aircraft. The first railway station at the airport followed in 1978. The construction of a new Air Traffic Control tower was completed in 1991 as the existing tower could no longer oversee all of the airport as it was further expanded. Departure Hall 3 was added to the terminal in 1993, as was another pier, G-pier. New wayfinding signage was designed that year as well by Paul Mijksenaar. A sixth runway was completed at quite some distance west of the rest of airport in 2003 and was nicknamed the Polderbaan, with the connecting taxiway crossing the A5 motorway. The distance of this runway means that taxi times to and from this runway can take between 10 and 20 minutes. It also required the construction of an additional Air Traffic Control tower as the primary tower is too far away to oversee this part of the airfield. On 25 February 2005, a diamond robbery occurred at Schiphol's cargo terminal. The robbers used a stolen KLM van to gain airside access. The estimated value of the stones was around 75 million euros, making it one of the largest diamond robberies ever. Later in 2005, a fire broke out at the airport's detention centre, killing 11 people and injuring 15. The complex was holding 350 people at the time of the incident. Results from the investigation almost one year later showed that fire safety precautions were not in force. A national outrage resulted in the resignation of Justice Minister Piet Hein Donner (CDA) and Mayor Hartog of Haarlemmermeer. Spatial Planning Minister Sybilla Dekker (VVD) resigned as well, because she bore responsibility for the construction, safety, and maintenance of state-owned buildings. Schiphol uses a one-terminal concept, where all facilities are located under a single roof, radiating from the central plaza, Schiphol Plaza. The terminal is divided into three sections or halls designated 1, 2 and 3. The piers and concourses of each hall are connected so that it is possible, on both sides of security or border inspection, to walk between piers and halls, although border control separates Schengen from non-Schengen areas. The exception to this is the low-cost pier M: once airside (past security), passengers cannot access any other areas. 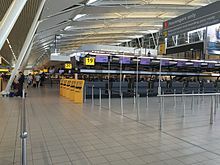 Schiphol Airport has approximately 165 boarding gates including eighteen double jetway gates used for widebody aircraft. The airport adopted a distinctive design, with the second jetway extending over the aircraft wing hanging from a steel cantilever structure. Recent refurbishments have seen most of these jetways being replaced with a more conventional layout. Two gates feature a third jetway for handling of the Airbus A380. Emirates was the first airline to fly the A380 to Schiphol in August 2012, deploying the aircraft on its double daily Dubai–Amsterdam service. During the summer, China Southern Airlines also uses the A380 on its Beijing–Amsterdam route. Schiphol has large shopping areas as a source of revenue and as an additional attraction for passengers. Schiphol Plaza not only connects the three halls but also houses a large shopping centre and the railway station, also attracting general visitors. Departure Hall 1 consists of Piers B and C, both of which are dedicated Schengen areas and shares D-pier with Departure hall 2. Pier B has 14 gates and Pier C has 21 gates. Pier D is the largest pier and has two levels. The lower floor houses non-Schengen flights and the upper floor is used for Schengen flights. By using stairs, the same jetways are used to access the aircraft. Schengen gates are numbered beginning with D-59; non-Schengen gates are numbered from D-1 to D-57. Pier E is a dedicated non-Schengen area and has 14 gates. It is typically home to SkyTeam hub airlines Delta Air Lines and KLM, along with other members, such as China Airlines and China Southern Airlines. Other Middle Eastern and Asian airlines such as EVA Air, Etihad Airways, Iran Air and Air Astana also typically operate out of Pier E.
Departure Hall 3 consists of three piers: F, G, and H/M. Pier F has 8 gates and is typically dominated by SkyTeam members such as primary airline KLM, Kenya Airways, China Airlines and China Southern Airlines, and other members. Pier G has 13 gates and is the only pier that handles daily Airbus A380 service, by Emirates and China Southern Airlines. Piers F and G are non-Schengen areas. Piers H and M are physically one concourse consisting of 7 shared gates and are home to low-cost airlines. Operating completely separately, H handles non-Schengen flights while M is dedicated to flights within the Schengen area. A new general aviation terminal was opened in 2011 on the east side of the airport, operated as the KLM Jet Center. The new terminal building has a floorspace of 6,000 m2 (65,000 sq ft); 1,000 m2 (11,000 sq ft) for the actual terminal and lounges, 4,000 m2 (43,000 sq ft) for office space and 1,000 m2 (11,000 sq ft) for parking. In summer 2010, Schiphol Airport Library opened alongside the museum, providing passengers access to a collection of 1,200 books (translated into 29 languages) by Dutch authors on subjects relating to the country's history and culture. The 89.9 m2 (968 sq ft) library offers e-books and music by Dutch artists and composers that can be downloaded free of charge to a laptop or mobile device. Schiphol has its own mortuary, where the dead can be handled and kept before departure or after arrival. Since October 2006, people can also hold a wedding ceremony at Schiphol. Schiphol also has a new state-of-the-art cube-shaped Hilton Amsterdam Airport Schiphol with 433 rooms, rounded corners and diamond-shaped windows. The spacious atrium has a 41-metre-high (135 ft) ceiling made of glass and is in the heart of the building. A covered walkway connects the hotel directly to the terminal. The hotel was completed in 2015. In 2012, Schiphol Group announced an expansion of Schiphol, featuring a new pier, an expansion of the terminal, and a new parking garage. Pier A will be part of Departure Hall 1, which already has Pier B (14 gates) and Pier C (21 gates). The new Pier A will have 11 gates for flexible use. It can handle either 3 wide-body aircraft and 5 narrow-body aircraft, or 11 narrow-body aircraft. The first activities are expected to start in 2017 and to be completed in 2023. The expansions will cost about 500 million euros. First, the new Pier A will be built to the southwest of Pier B, in an area currently used as a freight platform. Expected to be operational by the end of 2019, pier A will mainly be used for flights within Europe. To handle future growth in passengers, Schiphol will further expand the terminal and build a fourth departure hall with facilities for both departures and arrivals. From this new building, direct access will be made to Schiphol Plaza, continuing the one-terminal concept. When finished in 2023, Schiphol will be able to handle over 70 million passengers. Due to rapid growth of Schengen passengers during 2016, Schiphol was however forced to rapidly build a temporary departure hall which opened in March 2017. The Schiphol air traffic control tower, with a height of 101 m (331 ft), was the tallest in the world when constructed in 1991. Schiphol is geographically one of the world's lowest major commercial airports. The entire airport is below sea level. The lowest point sits at 3.4 m (11 ft) below sea level: 1.4 m (4.5 ft) below the Dutch Normaal Amsterdams Peil (NAP). The runways are around 3 m (9.8 ft) below NAP. 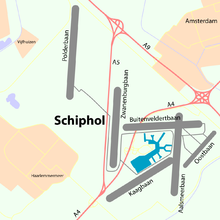 Schiphol has six runways, one of which is used mainly by general aviation. AMS covers a total area of 6,887 acres (2,787 ha) of land. 12,467 ft Polderbaan Decided via contest. Polder is the Dutch word for land reclaimed from a body of water. Schiphol Airport is situated in a polder. Asphalt Newest runway, opened 2003. Own control tower. Located to reduce the noise impact on the surrounding population. Takeoffs only northbound and landings only southbound. The nearest end is located 5 km (3.1 mi) from the terminal building, and aircraft have a lengthy 15-minute taxi to and from the Terminal. 11,483 ft Kaagbaan Named after the Kagerplassen, a cluster of lakes which lies beyond the end of the runway. Asphalt Opened in 1960. The Kaagbaan offered a location for spotters until the spotting location was closed in January 2008. 11,329 ft Buitenveldertbaan Named after Buitenveldert, a neighbourhood of Amsterdam. Asphalt Opened in 1967. El Al Flight 1862 was trying to make an emergency landing on this runway when it crashed into a block of flats in the Bijlmermeer. 11,155 ft Aalsmeerbaan Named after the town of Aalsmeer. Asphalt Opened in 1950. 10,826 ft Zwanenburgbaan Named after the village of Zwanenburg. Asphalt Opened in 1968. El Al Flight 1862 took off from this runway before crashing into flats in the Bijlmermeer when the plane was trying to return to the airport. 6,608 ft Oostbaan Most eastern of all runways. Asphalt Opened in 1945. Primarily used for general aviation traffic. In October 2010 a B-737 of Corendon Airlines overshot the short runway and ended up with its nosegear in the mud. Other regular users of Schiphol are the Dutch Coast Guard whose aircraft are operated by the Royal Netherlands Air Force, the Dienst Luchtvaart Politie and the Dutch Dakota Association. The TransPort Building on the Schiphol Airport property houses the head offices of Martinair and Transavia. Construction of the building, which has 10,800 m2 (116,000 sq ft) of rentable space, began on 17 March 2009. Schiphol Group and the architect firm Paul de Ruiter designed the building, while De Vries and Verburg, a firm of Stolwijk, constructed the building. The World Trade Center Schiphol Airport houses the head office of SkyTeam, the Netherlands office of China Southern Airlines, and the Netherlands offices of Iran Air. The head office of Schiphol Group, the airport's operator, is located on the airport property. The Convair Building, with its development beginning after a parcel was earmarked for its development in 1999, houses KLM offices, including KLM Recruitment Services and the head office of KLM Cityhopper. The original control tower of Schiphol Airport, which the airport authorities had moved slightly from its original location, now houses a restaurant. The area Schiphol-Rijk includes the head offices of TUI fly Netherlands and Amsterdam Airlines. At one time KLM had its head office briefly on the grounds of Schiphol Airport. Its current head office in nearby Amstelveen had a scheduled completion at the end of 1970. Previously Martinair had its head office in the Schiphol Center (Dutch: Schiphol Centrum) at Schiphol Airport. Formerly, the head office of Transavia was in the Building Triport III at Schiphol Airport. NLM Cityhopper and later KLM Cityhopper previously had their head offices in Schiphol Airport building 70. Nippon Cargo Airlines has its Europe regional headquarters at Schiphol. The National Aerospace Museum Aviodome–Schiphol was previously located at Schiphol. In 2003 the museum moved to Lelystad Airport and was renamed the "Aviodrome." The Nederlandse Spoorwegen (NS), the national Dutch train operator, has a major passenger railway station directly underneath the passenger terminal complex that offers transportation 24 hours a day into the four major cities Amsterdam, Utrecht, The Hague and Rotterdam. There are efficient and often direct services to many other cities in the country. 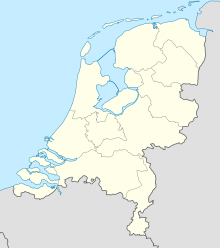 There are intercity connections to Almere, Lelystad, Amsterdam Centraal, Utrecht Centraal, both The Hague Centraal and The Hague HS, Rotterdam Centraal, Eindhoven, 's-Hertogenbosch, Leeuwarden, Groningen, Amersfoort, Apeldoorn, Deventer, Enschede, Arnhem, Nijmegen and Heerlen. Schiphol is also a stop for the Thalys international high-speed train, connecting the airport directly to Antwerp, Brussels, Lille and Paris Gare du Nord, as well as to Bourg St Maurice (winter) and Marseille (summer). The Intercity-Brussel (also named "beneluxtrein") to Antwerp and Brussels stops 16x a day at the airport. Amsterdam Airport Schiphol is also easily accessible by bus, as many services call or terminate at the bus station located outside in front of the terminal building. Amsterdam, Leidseplein/city centre 397, night bus N97 "Amsterdam Airport Express"
The Taiwanese EVA Air provides private bus services from Schiphol to Belgium for its Belgium-based customers. The service, which departs from and arrives at bus stop C11, goes to Sint-Gillis, Brussels (near the Brussels-South (Midi) railway station) and Berchem, Antwerp (near Antwerp-Berchem bus station). The service is co-operated with Reizen Lauwers NV. On 14 November 1946, a Douglas C-47 operated by KLM from London approached Schiphol during bad weather conditions. The first two attempts to land failed. During the third attempt, the pilot realized that the airplane was not lined up properly with the runway. The aircraft made a sharp left turn at low speed, causing the left wing to hit the ground. The airplane crashed and caught fire, killing all 26 people on board. On 4 October 1992, El Al Flight 1862, a Boeing 747-200F cargo jet en route to Tel Aviv, lost both right-wing engines (#3 and #4) just after taking off from Schiphol and crashed into an apartment building in the Bijlmer neighbourhood of Amsterdam while attempting to return to the airport. A total of 43 people were killed, including the plane's crew of three and a non-revenue passenger. In addition to these fatalities, 11 persons were seriously injured and 15 persons received minor injuries. On 4 April 1994, Flight KL433 to Cardiff, a Saab 340 operated by KLM Cityhopper, returned to Schiphol after setting the number two engine to flight idle because the crew mistakenly believed that the engine suffered from low oil pressure because of a faulty warning light. On final approach at a height of 90 ft (27 m), the captain decided to go-around and gave full throttle on only the number one engine leaving the other in flight idle. The airplane rolled to the right, pitched up, stalled and hit the ground at 80 degrees bank. Of the twenty-four people on board, three were killed including the captain. Nine others were seriously injured. 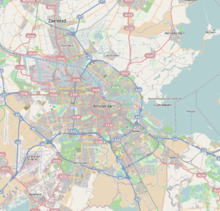 On 25 February 2009, Turkish Airlines Flight 1951, a Boeing 737-800 from Istanbul crashed on approach, just 1 km (0.6 mi) short of the airport's Polderbaan runway. The plane carried 128 passengers and 7 crew on board. 9 people were killed and a further 86 were injured, including six with serious injuries. Four of the dead were employees of Boeing, involved in an advanced radar deal with Turkey. An initial report from the Dutch Safety Board revealed that the left radio altimeter had failed to provide the correct height above the ground and suddenly reported −8 ft (−2.4 m). As a result of this the autothrottle system closed the thrust levers to idle, as it is programmed to reduce thrust when below 27 ft (8.2 m) radio altitude. This eventually resulted in a dropping airspeed that was not acted upon until it was too late to recover, and the aircraft stalled and crashed in a field. ^ "Amsterdam airport – Economic and social impact". Ecquants. Archived from the original on 29 October 2013. Retrieved 7 September 2013. ^ "CBS StatLine – Luchtvaart; maandcijfers Nederlandse luchthavens van nationaal belang". Retrieved 26 December 2014. ^ "Transport and Traffic statistics". Retrieved 26 December 2014. ^ "Annual Report Schiphol Group 2010". Schipholgroup. 2010. Archived from the original on 15 December 2012. ^ "Annual Report Schiphol Group 2009". Schipholgroup. 2010. ^ "Lelystad Airport krijgt ruimte om te groeien | Nieuwsbericht | Rijksoverheid.nl". www.rijksoverheid.nl. Retrieved 22 August 2015. ^ "Waar komt de naam Schiphol vandaan?". Schiphol Nederland B.V. 2013. Archived from the original on 19 November 2011. ^ "Stelling van Amsterdam – Fort van het Schiphol" (in Dutch). Stelling-Amsterdam.nl. Retrieved 24 May 2013. ^ Williamson, Mitch (23 November 2007). "War and Game: Fokker Aircraft Company 1910–45". Warandgame.info. Archived from the original on 12 July 2012. Retrieved 27 July 2012. ^ Rawthorn, Alice (21 October 2012). "Designers of the Signs That Guide You". The New York Times. Retrieved 24 May 2013. ^ "Amsterdam Airport Schiphol". Mijksenaar bv. 2009. Archived from the original on 24 May 2009. ^ Schiphol Junior Geschiedenis Schiphol, article retrieved 21 July 2014. ^ Rosie Cowan. "Up to £52m in gems stolen in airport raid". the Guardian. Retrieved 26 December 2014. ^ Crouch, Gregory; Simons, Marlise (27 October 2005). "11 Die in Fire at Dutch Airport Detention Center". The New York Times. ^ "Amsterdam joins Emirates' A380 network" Archived 10 November 2013 at the Wayback Machine Archived 10 November 2013 at the Wayback Machine. Emirates Netherlands. (15 February 2012). ^ Schiphol.nl – New General Aviation Terminal at Schiphol-East opened for use, article retrieved 8 June 2014. ^ "Rijksmuseum Amsterdam Schiphol". Rijksmuseum. Retrieved 24 May 2013. ^ Clark, Nicola (15 September 2010). "At Schiphol, an Unlikely Sanctuary of Books". The New York Times. Retrieved 24 May 2013. ^ "Fokker 100 van KLM op Panoramaterras Schiphol". Schiphol Amsterdam Airport. 8 June 2011. Archived from the original on 4 June 2011. ^ Baskas, Harriet (10 June 2008). "Will you marry me at the airport?". USA Today. Retrieved 24 May 2013. ^ "Hilton Amsterdam Airport Schiphol". Archived from the original on 24 September 2015. Retrieved 26 December 2014. ^ "Pier A". Archived from the original on 14 October 2014. Retrieved 26 December 2014. ^ "New car park P3". Retrieved 26 December 2014. ^ "Groen licht voor nieuwe pier en terminal Schiphol". Retrieved 16 March 2016. ^ "Schiphol in 2016 van start met bouw nieuwe pier en terminal". Retrieved 12 August 2014. ^ "Onverwachte groei passagiers levert Schiphol tijdelijke vertrekhal op - Amsterdam - PAROOL". Het Parool. ^ "AHN – Actueel Hoogtebestand Nederland – homepage". Retrieved 26 December 2014. ^ "Schiphol | Airport Facts about Dutch international airport". Schiphol. Retrieved 7 August 2018. ^ "Thelma's Aircraft Spotting" (in Dutch). vakantielandnederland.nl. Retrieved 24 May 2013. ^ "Corendon Ran Off Runway at AMS". Airliners.net. 2 October 2010. Retrieved 24 May 2013. ^ "Slovenian Airline Adria Airways offers tickets to and from Ljubljana and will fly you to your final destination with a smile!". adria.si. ^ "Route Map - Aegean Airlines". Aegean Airlines. ^ "Explore - Aer Lingus". aerlingus.com. ^ "Routemap". Aeroflot. Archived from the original on 12 July 2018. Retrieved 15 August 2018. ^ "Aeromexico". World.aeromexico.com. Retrieved 15 August 2018. ^ "Destinations - Air Arabia". airarabia.com. ^ "Route Map". Air Astana. ^ "Air Europa - Official Website". aireuropa.com. ^ "Network". 12 November 2014. ^ "Destinations - Flights to and from Malta by Air Malta". airmalta.com. ^ "KLM and Air Mauritius launch joint flights to Mauritius" (PDF). Air Mauritius. 15 February 2017. Retrieved 16 February 2017. ^ "Our destinations from Canada - Air Transat". Air Transat. ^ "60+ Destinations - Where We Fly - airBaltic". airbaltic.com. ^ "Network - Alitalia". corporate.alitalia.it. ^ "Europe − Plan travel − American Airlines". aa.com. ^ Arkia. "Arkia Israeli Airlines - Worldwide Destinations". arkia.com. ^ AtlasGlobal. "Online Flight Ticket and Booking - Atlasglobal EN". AtlasGlobal. ^ "Timetable - BELAVIA - Belarusian Airlines". en.belavia.by. ^ "Our route network - Flight information - British Airways". britishairways.com. ^ Development, Studio X Creative / Web Design /. "Airline ticket - Airline Bulgaria Air - Airline Bulgaria Air". air.bg. ^ "Route list and airports". Cathay Pacific. ^ "Route Map - China Eastern Airlines". nus.ceair.com. Archived from the original on 2 March 2018. Retrieved 16 July 2018. ^ "China Southern Airlines". global.csair.com. ^ "Corendon - Vluchtinformatie". corendon.nl. ^ HR, Croatia Airlines. "Croatia Airlines - Timetable Summer 2018". croatiaairlines.com. ^ "Destinations We Cover - Czech Airlines". ČSA.cz. ^ "Delta Routes : Delta Air Lines". delta.com. ^ "Delta W19 Long-Haul changes as of 14APR19". routesonline. Retrieved 15 April 2019. ^ "Delta's next global blockbuster: More trans-Atlantic flights from Los Angeles, Tampa Bay and New York City". Retrieved 22 August 2018. ^ "Route Map - Flights to European Destinations and Beyond - easyJet". easyjet.com. ^ "Home - easyJet.com". www.easyjet.com. ^ "EGYPTAIR Route Map". egyptair.com. ^ "Emirates Route Map". routemap.emirates.com. ^ "Etihad Airways Route Map". flights.etihad.com. ^ "Route network - Information - Eurowings". ^ "Route Maps - EVA Air - America". evaair.com. ^ "Book Finnair Flights to 1000+ Destinations". flights.finnair.com. ^ "Route Map - Flybe - Cheap Flights & Budget Flights". flybe.com. ^ "International Flight Routes - Garuda Indonesia". garuda-indonesia.com. ^ "Airline flight derictions". georgian-airways.com. ^ Iberia (25 January 2017). "Global Network - Iberia". ^ "Network and Routemap - Icelandair". icelandair.com. ^ "Destinations - Jet2.com". jet2.com. ^ "We offer International Flights for Various Destinations". Kenya Airways. Retrieved 15 August 2018. ^ "Flight Route Map - KLM.com". ^ van Woerkom, Klaas-Jan (21 September 2018). "KLM start lijndienst tussen Schiphol en Las Vegas". ^ "KLM opent dagelijks lijndienst naar Wroclaw". luchtvaartnieuws.nl. Retrieved 20 November 2018. ^ "KLM start vluchten naar Liberia in Costa Rica". luchtvaartnieuws.nl. Retrieved 9 April 2019. ^ "Route Map - Korean Air". koreanair.com. ^ a b c d e f g Steuer, René (14 March 2019). "Amsterdam: Anisec startet Level-Basis am 6. April 2019" [Level confirm Amsterdam shorthaul operation from April 2019]. Austrian Aviation Net (in German). CUBO MEDIA. Retrieved 14 March 2019. ^ "Route map - Norwegian". norwegian.com. ^ Pegasus. "Our Network - Pegasus Airlines". flypgs.com. ^ "Route Map - Royal Jordanian". rj.com. ^ "Official Ryanair website - Book direct for the lowest fares - Ryanair.com". ryanair.com. ^ "Destinations - SAS". flysas.com. ^ "Travel Destinations - Where to go for a Holiday - Singapore Airlines". singaporeair.com. ^ "Destination Map - SunExpress". ^ Travel, Love. "Route Map - Surinam Airways". ^ "Route network - All the destinations at a glance - SWISS". swiss.com. ^ "Map of destinations – Find your trip | TAP Air Portugal". Flytap.com. Retrieved 15 August 2018. ^ "TAROM Routes map - TAROM - Official Website". tarom.ro. ^ "Where We Fly - Thomas Cook Airlines". Thomascookairlines.com. 22 November 2015. Retrieved 15 August 2018. ^ "Transavia flýgur til Keflavíkur". Morgunblaðið. ^ "Tunisair's Network : Tunisair Cheap flights to Tunisia". Tunisair.com. Retrieved 15 August 2018. 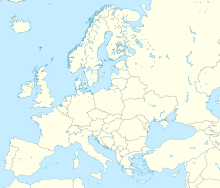 ^ "Air Routes Map – Ukraine International Airlines (UIA) (Netherlands)". FlyUIA. ^ "XIAMEN AIRLINES-Xiamen air (Europe)". xiamenair.com. ^ "Freighter schedule" (PDF). airchinacargo.com. ^ 2017, UBM (UK) Ltd. "Emirates SkyCargo adds Amsterdam – Luxembourg sector in W17". ^ "New building Martinair Headquarters" (Press release). Martinair. June 2010. Archived from the original on 15 June 2013. Retrieved 24 May 2013. ^ "Schiphol Real Estate delivers "TransPort" sustainable office building" (Press release). Schiphol Group. 16 March 2010. Archived from the original on 6 January 2014. Retrieved 24 May 2013. ^ "SkyTeam Marks Major Milestones Toward A Centralized Organization". SkyTeam.com. 25 July 2009. Archived from the original on 19 May 2011. ^ "Welcome to WTC Schiphol Airport". World Trade Center Schiphol. Retrieved 24 May 2013. ^ "China Southern Airlines Amsterdam Contact Information". China Southern Airlines. Archived from the original on 12 June 2013. Retrieved 24 May 2013. ^ "Contact Archived 14 March 2013 at the Wayback Machine Archived 26 May 2013 at the Wayback Machine." Iran Air Netherlands. Retrieved on 29 January 2011. "Iran Air sales office at WTC Schiphol building" and "World Trade Center Tower A – Level 3, Schiphol Blvd.191 1118 BG Schiphol The Netherlands Sita: AMSSNIR "
^ "Contact." Schiphol Group. Retrieved on 8 November 2010. ^ a b "Annual Report 1999." (Archive) Schiphol Group. 35 (36/87). Retrieved on 20 February 2011. ^ "Country: NL – NETHERLANDS Archived 19 July 2011 at the Wayback Machine Archived 19 July 2011 at the Wayback Machine." Joint Aviation Authorities Training Organisation. Retrieved on 20 February 2011. "KLM CITYHOPPER BV AOC Num: NL- 2/64 Expiry Date: 01-01-08 Convair Gebouw, Stationsplein 102 1117 BV Schiphol Oost Netherlands." ^ "Contact." (Dutch) KLM. Retrieved on 20 February 2011. "KLM Recruitment Services (SPL/GO) Stationsplein 102 (Convair Building) 1117 BV Schiphol-Oost"
^ "Arkefly." TUI Nederland. Retrieved on 28 September 2009. "ArkeFly Beech Avenue 43 1119 RA Schiphol-Rijk Postbus 75607 1118 ZR Schiphol-Triport "
^ "Contact Us Archived 7 July 2011 at the Wayback Machine Archived 7 July 2011 at the Wayback Machine." Amsterdam Airlines. Retrieved on 20 February 2011. "Office Address: Het Poortgebouw Beech Avenue 54–80 1119 PW Schiphol-Rijk The Netherlands." ^ "World Airline Directory." Flight International. 10 April 1969. 578. "Head Office: Schiphol Airport, Amsterdam, Netherlands." ^ "KLM's New Head Office." Flight International. 6 June 1968. 855. Retrieved on 25 October 2010. ^ " Both Martinair and Transavia now share a headoffice at Schiphol-Oost.STCC TRANSAVIA." TUI fly Netherlands. Retrieved on 16 February 2011. "transavia.com Westelijke Randweg 3, building Triport III 1118 CR Schiphol Airport"
^ "General Conditions of Passage Archived 17 July 2011 at the Wayback Machine Archived 17 July 2011 at the Wayback Machine." Transavia.com. 28/28 Retrieved on 16 February 2011. "Address for visitors: transavia.com Westelijke Randweg 3, building Triport III 1118 CR Schiphol Airport"
^ "Annual Report 2004/2005." Transavia.com. 28/28. Retrieved on 16 February 2011. "transavia.com Westelijke Randweg 3 P.O. Box 7777 1118 ZM Schiphol Centrum The Netherlands"
^ a b "World Airline Directory." Flight International. 27 March – 2 April 1991. 98. "Head Office: Building 70, PO Box 7700, 1117 ZL Schiphol Airport (East), The Netherlands." ^ "Europe." Nippon Cargo Airlines. Retrieved on 17 February 2012. "Vrachtstation 5, Pelikaanweg 47,1118DT, Luchthaven Schiphol, The Netherlands"
^ "Engels." National Aerospace Museum Aviodome–Schiphol. 6 August 2002. Retrieved on 26 December 2011. "Westelijke Randweg 201, 1118 CT Luchthaven Schiphol"
^ "Engels." Aviodrome. 21 June 2003. Retrieved on 26 December 2011. ^ "Nederlandse Spoorwegen official website". ^ Schiphol. "Schiphol – Busdiensten" [Schiphol – Bus services]. schiphol.nl (in Dutch). Archived from the original on 1 March 2012. Retrieved 25 February 2012.